One of the most humble pieces of equipment in airsoft is the BB. When they work right, they go unnoticed. It’s when a BB shatters in the magazine or in the barrel of your airsoft gun do you appreciate the importance of quality ammo in airsoft. Buying the right BBs can be a tough choice since all brands will a synonym for quality in their name. Don’t let word choice fool you. Let Tactical Airsoft Magazine help you find the best BBs for your next 6mm warfare session. As with many things in airsoft, not all BBs are created equally. Different types of BBs have different uses and qualities. With an adjusted hop-up unit, a heavier BB generally gives you more range. Most fields ask that you test your airsoft gun’s feet per second at the chronograph station with .20 gram BBs. This is so the administrators can set a safety standard. When you take to the field, you can usually choose any weight. For indoor play, .25g BBs are enough. When you go outdoors, you’ll want BBs that weigh .28g or more. These heavier BBs will be able to resist the wind and pierce a leaf without losing accuracy on their way to their target. The most cost-effective way to buy BBs is in bulk. The more that come in a particular order, the less it ends up costing you. Find a brand you and your friends trust and make a BB cash pool to buy tens or hundreds of thousands at once. You’ll have a lot of BBs, sure, but the cost to each of you will be less than if you purchased alone. Storing that many BBs can be a problem. Clean out any plastic bottles or tubs you have around the house and use those. Protein powder and large water bottles make good BB storage. BBs in All the Colors of the Rainbow! In your searches, you may have come across BBs in different colors. You may have wondered to yourself why those exist. 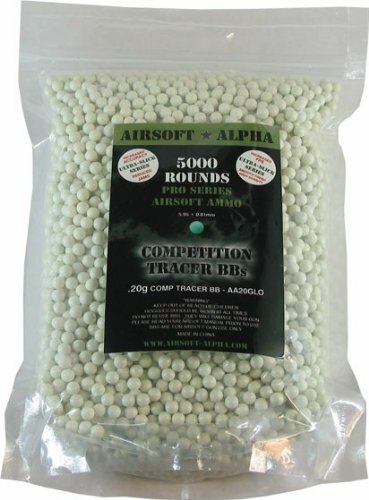 Well, if you’ve been to any airsoft games, you’ll find you can see the small white pellets flying around the field before they hit you. If you react fast enough, you may even be able to dodge an incoming stream. Dark colors like black or brown will be harder to see. Keep in mind that you won’t be able to see your BBs easily either. You may also want to get BBs in your favorite color just to invite good mojo onto your side of the fight. Here’s what not to do when working with BBs. Don’t use the ones that come in the box with your airsoft gun purchase. These BBs are there just to test your gun. Even then, it’s best to test with the BBs you use at the field. Generally, the brands you find at big box stores are ones you will want to avoid. These BBs are fine in a pinch, but they will not perform well in higher end airsoft guns. They are not made with quality in mind. Crack one of these BBs open and you will find pockets and imperfections inside. This means that there is a lot of air inside the BB. Because of this, low-quality BBs will break when they come into contact with your high-end motor. You’ll also find paint BBs. They are just like their 6mm plastic counterparts, except they are filled with paint. Don’t use these with your high-powered expensive guns. They will pop inside your gun and you will get paint everywhere. Also, don’t reuse BBs once they have been fired. The whole process warps them beyond safe use. You risk damaging your gun trying to save a little money. Some outdoor fields require biodegradable BBs. Nature can eventually break down the plastic in any round. Bio BBs take months and years instead of decades and centuries to degrade, though. Because of this, they are considered more environmentally friendly. Elite Force claims their bio BBs degrade in 180 days under the most hostile conditions. That combined with the quality of the BB veterans expect from Elite Force should make them your first choice when it comes to bio BBs. These BBs come in .20g, .25g, .28g, and a hefty .32g. They are a good fit for any airsoft gun in your arsenal. You do pay more to be nice to the outdoor field you play at. If you want to be a responsible airsofter, bio BBs must be on your gear list for outdoor play. And the best bio BBs out there come from Elite Force. Tracer BBs glow in the dark with the use of tracer units and magazines. A tracer unit is a device that attaches to the barrel of an airsoft gun like a suppressor. Inside the unit are a sensor and a bright flashbulb. When a BB passes through the unit, bright light flashes and activates the BBs glowing quality. Tracer magazines work similarly, except the device flashes light in the feeding channel. Airsoft Alpha’s tracer BBs glow green when exposed to a tracer device. When you play at night or indoors, you should be able to see your BBs travel to their target. You’ll better be able to adjust your aim and you’ll know for sure when you hit your enemy. It’s hard to miss green glowing pellets bouncing off of a tactical vest. While you do need a tracer device to use Airsoft Alpha’s tracer BBs right, you will immediately see the benefits. Remember, tracers work both ways. You’ll see where you’re shooting, but the enemy will see where you’re shooting from. It should be no surprise that Elite Force’s BBs make this list twice. Many airsofters on forums will recommend Elite Force BBs. Their smoothness, low weight variance and low amount of air pockets contribute to their quality. Elite Force claims to test them in many different types of magazines, so you shouldn’t see any feeding problems. They also come in a convenient bottle, which makes filling your high capacity magazines easier. While the limited weight choices keep these BBs from rising to the top, you only need .25g for indoor play. Trust that Elite Force will carry the day in close quarters situations. For their price, the GoldenBall Competition Grade series of BBs are some of the best. As you can see, they come in many weights: .20g , .23g , .25g , and .30g. Any airsoft gun you have will be able to use GoldenBall BBs. The BBs are seamless and have very few pockets for air to undermine the integrity of the round. The Japanese manufacturers have stringent quality standards for their airsoft ammunition. The low count per bag means you can’t buy in bulk. You’ll feel it in the wallet, but your airsoft arsenal will thank you. You didn’t count your pennies when it came to getting your plate carrier and pouches. You didn’t scrimp on your airsoft gun. Don’t let the low prices of inferior BBs tempt you. You save money there, but only a few dollars. You’ll spend that much and more when you pay for repairs to your inner barrel when BBs shatter in it. The price differences between each brand in the list are not drastic, as it the case with any BB you choose. 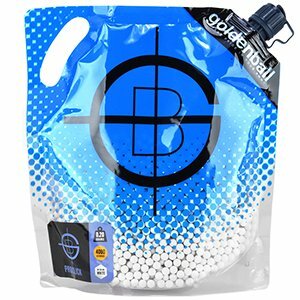 GoldenBall BBs win out because of the weight varieties and their superior quality. 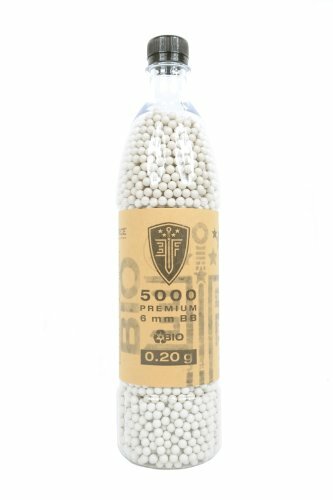 These BBs and BBs like them are the best fit for your high-end airsoft guns. They will contribute to your accuracy and give you the edge you need to succeed in airsoft combat.